There are quite a few apps for Windows (not surprisingly, as it’s where the gamers are), but options for Mac, as well. If you’ve got Max/MSP, try out the hi (“human interface”) object for use with USB devices (or joysticks hooked into a USB adapter). If you’re using Max’s open source cousin Pd (Pure Data), try out the free HID external. What I especially like about the latter is that there are additional objects for force feedback (awesome), but it’s in alpha, so your mileage may vary. Max’s “hi” is built-in; both “hi” and HID are cross-platform. The advantage of working in an environment like Pd or Max is you have additional control over what to do with the data, but if you aren’t ready to take the plunge, the other Windows or Mac drivers will let you connect your joystick to any Mac or Windows app. Playing music with a joystick sounds silly? If you need something more practical, think 3D: mice are limited when it comes to interfacing with 3D visuals, but joysticks are built for the task. Whether you’re doing live visuals on your 3D gaming card or building a new interface for music in three dimensions, that gets very exciting fast. 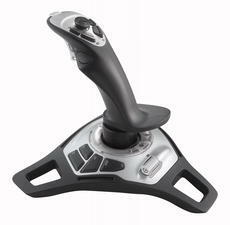 Or you could just use that joystick to control X/Y parameters on your favorite soft synth. Because, really, that dinky little joystick stuck onto your old Korg keyboard just ain’t the same.